1 - 3	 $27.77 ea. 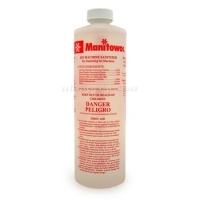 Ice Machine Sanitizer/Pint - 16 OZ bottle of Factory Original Manitowoc Ice Machine Sanitizer - 94-0565-3. Same as 94-0581-3 in smaller bottle. For sanitizing Manitowoc ice machines and refrigerated storage equipment. Equipment must be thoroughly cleaned and mineral deposits removed with approve Manitowoc Cleaner prior to use. Do not rinse with water or wipe after applying sanitizer. Also known as part number 000005164 and 9405653.